Ray Kaiser and Charles Eames met in 1940 after Ray entered the Cranbrook Academy of Art in Bloomfield Hills, Michigan. Charles Eames was there studying with fellow modernist designer Eero Saarinen and would soon become head of the industrial design department. Eames and Saarinen were working on a design for a molded plywood chair to submit to The Museum of Modern Art’s “Organic Design in Home Furnishings” exhibition and competition. Ray assisted them in preparing the drawings, which would eventually win the first place prize. After marrying in 1941, the couple moved to California where they opened an office in a renovated garage space. Their innovative designs would change the way that both domestic and residential spaces would be decorated. 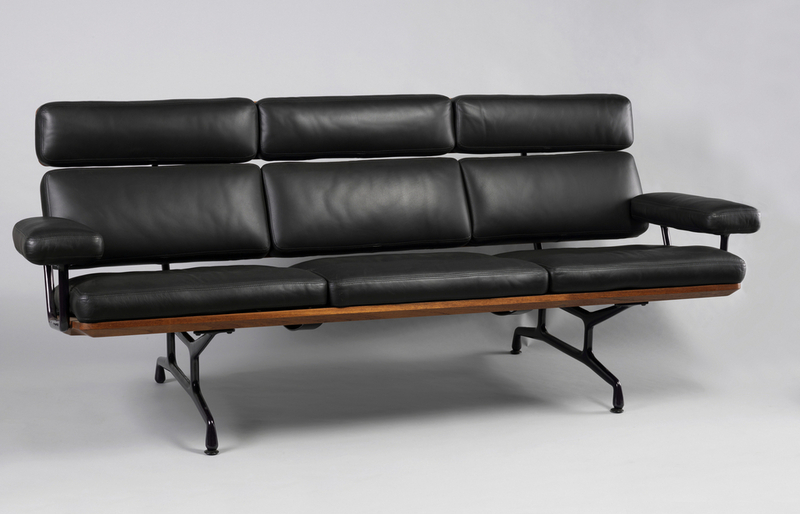 The ES 108 sofa was one of the last pieces of furniture to be produced by the Eames Office, the duos’ workshop and laboratory of design for over thirty years. Ray completed the design along with her team after Charles’ death in 1978. The sofa went into production in 1984 by Herman Miller Inc. and is still being produced today. Known for producing high quality traditional wood furniture in the 1920s, the company began to manufacture modern design in order to increase sales during the Great Depression. By the 1950s and 60s, working with the Eames and other modernist designers, the firm created clean minimal forms for both commercial and domestic interiors, many becoming mid-century design classics. The ES 108 is composed of a harmonious mix of walnut and soft leather upholstery along with a polished aluminum frame, promoting an “honest use of materials” as championed by Charles Eames. This sofa can be seen in Ellen DeGeneres Selects, on view through May 21, 2017.